Inazuma Eleven 2 takes the term Fantasy Football very seriously, picking up where the first game left off with more moves, more characters and an alien invasion that needs to be thwarted with a kickabout. Tim looked grumpy. He swore to himself that he'd never let Graham drag him to another football match; certainly not again after the last time. He wasn't even sure of all of the rules and after standing in the rain, watching other wet people contest possession for 90 minutes only to lead to a nil-all draw, he'd decided this wasn't the game for him. Graham said to him, "will you get that tired look of your face, Tim. This is going to be a great match!" In response to this, Tim told Graham that he'd already seen a football match and it was the dullest experience of his life. He had no wish to sit through it again. "But that was just one match," Graham told him, "that's the beauty of football: Maybe you did see a previous game that wasn't any good, but every game is a fresh sheet. I'm telling you, give the sport a second chance with this game and you won't be sorry..."
I'm on record here as hating Inazuma Eleven (DS). I couldn't come to terms with the mix of fiddly arcade challenge mixed with RPG stats. Inazuma Eleven 2 takes exactly the same approach, but somehow I found myself not hating it. In fact I quite enjoyed it. Which leads me to question whether the game has changed, or whether my expectations have shifted. I can't put my finger on it. Whether it is the fact that Inazuma Eleven 2 wears its Sci-Fi credentials up-front, or that the plot is much better plotted and quick to get going or whether it is the more finely-tuned difficulty curve than the previous game. Somehow, this game manages to be something quite special. Maybe it's me. Maybe this time I had prior warning about the kind of game that was about to be thrust into my hands and I could fight the urge to be disappointed. This game manages to be something quite special. It still comes with some frustrations. There are still far too many battle calculations that are hidden away, making it very difficult to learn why you are failing to beat any given team. 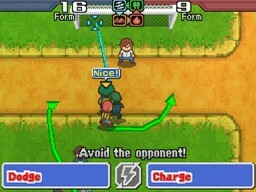 Some of the touch screen controls are too small and in the wrong place: it is common to attempt to pass the ball to a player in the top-right of the screen and end up clicking on the "S" button which kicks the ball in the direction of the goal. Not always helpful. Also, the menu system is horrible to navigate and could do with pulling apart and completely redesigning. Yet there is a huge but. 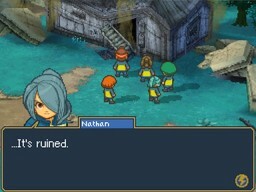 Somehow Inazuma Eleven 2 is a highly effective fantasy RPG with a great narrative and a real sense of challenge. The plot gets underway far more quickly than the first games interminable to-ing and fro-ing. The antagonistic challenge is also far clearer, in the shape of invading aliens who are using a dark football to destroy all the football academies around Japan. It's ludicrously far-fetched hokum, but fantastic for it. 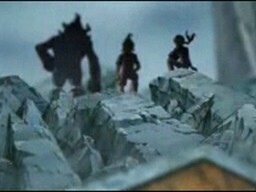 There is no effort made to explain why the former world champion players are all now level one newbies again. Nobody questions why the military haven't deployed weapons against these aliens, rather than simply relying on a group of kids to beat them at sport. Inazuma Eleven 2 exists within its own beautiful narrative world and, like Pokemon Black/White (DS), brings to life a vivid fantasy world that could exist nowhere else. It's also a surprisingly effective story and copes ably with the narrative challenges of working with such a massive cast of characters. The real success with Inazuma Eleven 2 is the episodic story format. 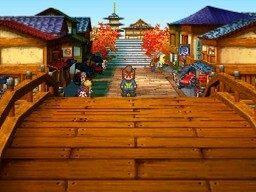 It isn't new for games to mimic a TV-show style narrative, but this games masters it. Not only does the ongoing narrative capture the building intrigue of a TV show, but it successfully breaks up a traditionally long RPG plot. I find it really helped to split what is probably a 30-40 hour RPG down into manageable chunks of narrative which are easier to engage with and the format remind the writers to keep interesting development coming regularly. It isn't new for games to mimic a TV-show style narrative, but this games masters it. 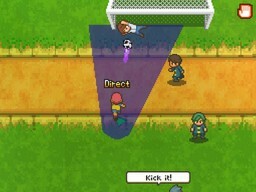 In this version it is easier to see how the fantasy special moves which punctuate the football matches are designed to represent the spirit of the game, if not the content. Facing a goalkeeper with a killer stopping move becomes a battle of attrition, wearing the keeper's action points down before substituting a fresh striker with a new move the opponent will simply not have the energy to stop. Even organising team formation so that your players get the benefit of a rock-paper-scissors battle system, somehow manages to imply the delicate balance between one on one battles that occur between players all the time on a real pitch. 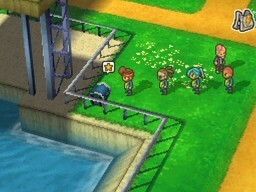 Inazuma Eleven 2 is also a wonderful homage to Japan's distinctive regions, attempting to capture through small locations the unique quality of different cities and areas, from the snow-capped mountains of Hokkaido to the antique charm of Kyoto. I'm not sure whether the graphics are an improvement on the previous game or not, but some how it feels like a more beautiful game world to inhabit. 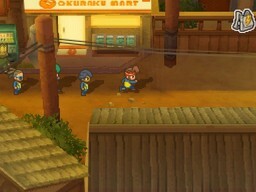 There is a Pokemon-style attempt at two different versions of this game, Firestorm and Blizzard, mainly offering some subtle plot differences and different unique players in each version. Honestly unless you're a real enthusiast you won't notice the difference between them. The individual players don't have the distinctiveness of Pokemon's menagerie and with 1500 players to recruit, you won't be short of options. 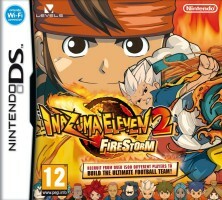 Overall, Inazuma Eleven 2 is a much more welcome RPG offering than the first. With tighter storytelling, manageable episodes and improved difficulty curve, it is immediately more accessible. The icing on the cake is the fabulous customary cartoon sequences, familiar in style to anybody who has played a Professor Layton game. It is a game which has conquered all my leftover reticence from the first entry. 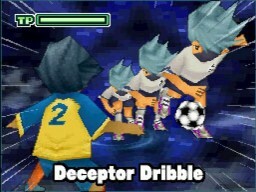 Inazuma Eleven 2 has achieved the gaming equivalent of winning the double.